Trooper Scott Smith from the Minnesota State Patrol will give a public lecture on traffic crash reconstructions. He will explain his use of site measurements, basic physics analysis, and modeling techniques to create final reports. Brian Noy is the new coordinator of the Campus Kitchen program at Augsburg College. Noy started Aug. 16 and is taking over for Rachel Vallens, who left to attend graduate school in Wisconsin. Noy is originally from Vernon Center, Minn., a small farming community south of Mankato. 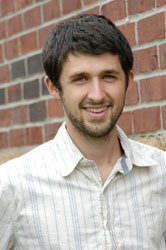 He graduated from the University of Minnesota in 2006 with a degree in Sustainable Agriculture. After graduation, Noy worked with the Institution for Agriculture and Trade Policy, which is a non-profit think tank research and policy institute. While there, he was instrumental in starting several small-scale farmers’ markets, including the one at the Brian Coyle Community Center. He came to learn about the Campus Kitchen program through Mary Laurel True, who met him at what Noy describes as a “local foods happy hour.” Given his interest in food and education around community gardens, he thought Augsburg would be a great fit for him. Noy said he is very excited and looking forward to getting the community garden off the ground next year. As a matter of fact, Noy said that four years ago he spotted this piece of land and thought then what a great spot this would make for a community garden.